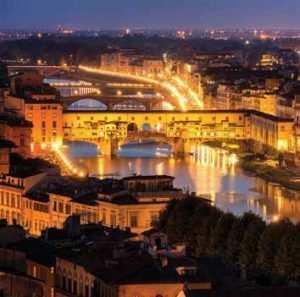 Florence, Italy, is one of Europe’s most enchanting cities to experience the sweet life, la dolce vita. Capital of Italy’s sun-blessed Tuscany region, Florence is considered the birthplace of the Renaissance. From exquisite art and architecture to enticing food and enchanting sunsets, this colorful city has it all. 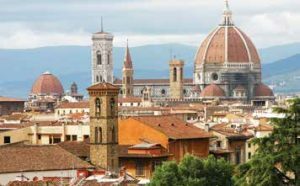 Climb the daunting 463 steps to the Brunelleschi’s red-tiled dome, or Cupola, and bell tower of the Duomo for incredible views of the city. Visit early in the morning to avoid long lines. 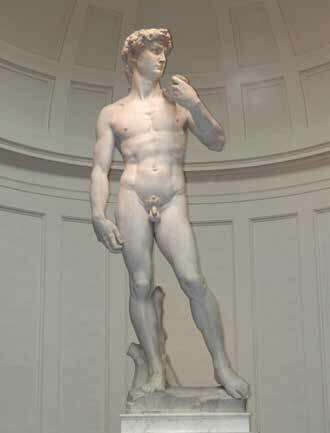 Michelangelo’s statue of David is also a mustsee at the nearby Galleria Dell’Accademia. Created at the beginning of the 16th Century, this 17-foot-high masterpiece was actually carved from a single piece of Carrara marble. Those looking to bring home their own piece of fair Firenze can shop along the city’s oldest bridge, the Ponte Vecchio, for gold and other jewelry. The original bridge was built during the 10th Century and reconstructed in 1345 following a flood. The city itself is a work of art, from mouthwatering pasta, gelato, and cappuccino to an amazing array of statues and architecture. 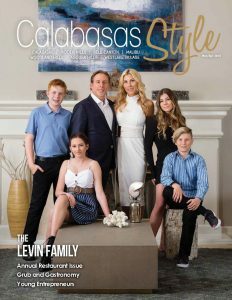 For the past 25 years, a Hapsburg prince and his family have shared ancient family recipes at their La Giostra restaurant, once the site of a colorful carousel. The succulent steak Florentine at Trattoria Zà Zà, near the San Lorenzo Market, also reigns supreme. Visitors hungry for more can explore the San Lorenzo Market for leather goods, pottery, souvenirs, and tasty local treats from olive oil to cheese. Those in search of art will find it everywhere. 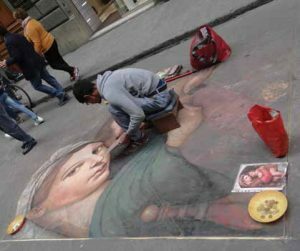 Madonnari, or street painters, even create vibrant chalk and pastel drawings directly on city streets. Since the 16th Century, artists have been creating these al fresco drawings, mostly inspired by the Madonna. 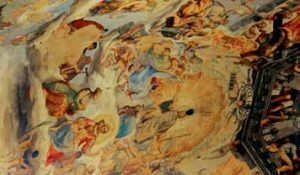 A visit to the immense Uffizi Gallery, housing masterpieces from such renowned Renaissance artists as Giotto, Botticelli, and Michelangelo, is also a must. Florence is a city that stays up well past midnight. When you’re finally ready to sink your head on a fluffy pillow and call it a night, you’ll find a wide range of 4- and 5-star hotels, VRBOs, and boutique lodgings, such as the Monna Lisa (yes, the spelling is correct) on the Borgo Pinti walkway. This historic hotel lies at the convenient city center. Formerly a monastery, it later served as the Renaissance-era residence Palazzo Marzichi Lenzi until the Dupre family converted it to a charming hotel in 1956. 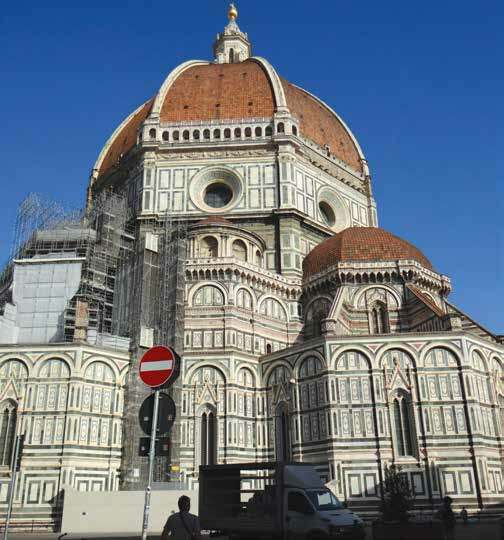 Wherever you roam in Florence, the art, cuisine, and culture of this ancient city will remain forever in your heart.